Harrogate Railway were beaten 3-2 by Albion Sports in their final game of the 2016/17 season. Ray Green’s side secured their NCEL Premier Division status when they drew at Bottesford Town last time out and went into Saturday’s fixture with the pressure off. 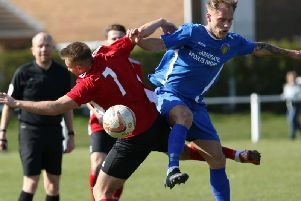 A difficult spell since the departure of former boss Paul Beesley in February had threatened to plunge the Railwaymen into trouble, but they eventually finished the campaign four points above the drop zone, with Barton Town Old Boys occupying the final relegation spot. And with their safety already assured, Green’s young side played with a measure of freedom against the Lions, twice going in front before eventually losing out to Alex Cusack’s well-taken hat-trick. “It was a fairly good performance, I’m happy with how we played but we didn’t quite get the result we wanted,” the Rail’s manager reflected. “Fair play to Albion Sports, they did have the better of the chances, but I’m disappointed with the amount of space we have allowed them for what were three soft goals. “Aside from that, we’ve done okay with a young side on the pitch once again, and it’s good for some of our young lads to get another game under their belts at this level. Albion had the better of the goalscoring opportunities during the opening half, twice hitting the woodwork, but Adam Carter fired Railway ahead in the 42nd minute when he got on the end of a Steve Bromley cross. The hosts’ lead lasted just three minutes, however, as Cusack headed in from close range to tie the scores before the interval. Five minutes after the resumption, Albert Ibrahimi struck to move the men from Station View back in front, but Cusack restored parity for a second time shortly after the hour-mark. A fine finish from the same player just four minutes later then ensured that the visitors left Starbeck with all three points.